This remarkable book has been described in many ways—as a masterpiece…a fairy story…a brilliant satire…a frightening view of the future. 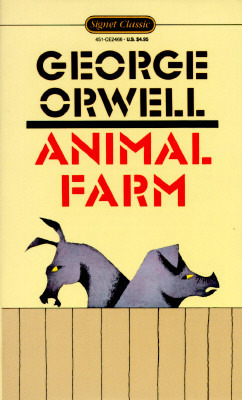 A devastating attack on the pig-headed, gluttonous and avaricious rulers in an imaginary totalitarian state, it illuminates the range of human experience from love to hate, from comedy to tragedy. Unlike most people, I did not have this book as required reading in high school and instead decided to read it 4 years after graduating. I had several friends in other English classes that had to read the book, so I knew the basic plot and what the theme was. However, I still wasn’t quite expecting what was actually in the pages of this book. This was written so well. I guess that’s to be expected with a classic such as this. It was written in an entertaining way, while still making me feel certain emotions toward certain characters. Even better, it was also written in a way that allowed me to understand what was going on and what the theme of the book was throughout the entirety of the book. Overall, I enjoyed this much more than I thought I was going to and definitely understand why this reading is incorporated in so many English classes throughout the world. Absolutely – it allows you to get a grasp on some big ideas without being overwhelmed.